For extra pizazz and sparkle in your dishes, you can’t go wrong with herbs. More than simply adding a burst of freshness, herbs add a bundle of flavour without adding anything nasty. Natural, healthy and fairly frugal, there’s never been a better time to make yourself acquainted with basil, thyme, coriander, mint, or any of their friends. 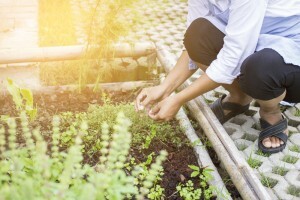 For those who want to go a little further than simply making friends, we’ll be showing you the top three benefits of starting your own herb garden in this week’s article. Soon, you’ll be one of those green-thumbed individuals, toiling away under the summer sun. Let’s start with one of the most compelling arguments… herbs are simply amazing for health. With well researched antioxidant properties, herbs are a great source of vitamins and essential oils needed to complete your healthy lifestyle. To really make use of your herbs, consider adding mint to your green tea concoctions, or sprinkling some parsley over your morning omelette. For those of us intimidated by gardening, it’s usually because we don’t have much space available to us! Or we’re put off by how much work seems to go into gardening. From fertilizing, to weeding, to pruning, to watering, gardening can seem like an overwhelming task really fast. But with herbs, you don’t have to worry about any of this! After you’ve put in the hard work setting up the garden itself, the herbs will soon begin to flourish on their own. Just make sure to check up on them every now and then, and water regularly- especially in the hot summer! Let’s be honest; the cost of adding supermarket herbs to your daily meals is going to add up. But with your own herb garden, you get ongoing access to delicious herbs at a tiny sliver of the supermarket price! Herbs truly are what you could call- low risk, high investment. Try it out for yourself today! All it takes to get started is a planting box, seeds, soil and a little love and care. A Better Driveway specialise in decorative concrete landscaping solutions such as exposed aggregate driveways. Get in touch by calling (03) 9308 6112 for more information today.